Photography doesn’t deal well with mental states because by construction, the camera only records surfaces. This basic fact is a particular challenge for those aiming to deal with mental illness using photography. Depictions typically oscillate between the two poles of people either looking catatonic or acting out (often violently). However much such expression of a person’s mental state might indeed be what an outsider witnesses, for sure it does the person in question a severe disservice: you don’t have a mental illness (like you have blond hair or brown eyes), you suffer from it. In fact, any depiction of a person’s mental state can easily become problematic. People suffer or are made to suffer in many places, and the world of photojournalism, for example, has developed a set of cliche approaches to deal with the various situations. In that world, one’s person’s suffering might not be depicted in the same way as another person’s. Obviously, suffering is always an individual feeling, but that’s not what I’m talking about here. A mother losing her child to violence in all likelihood is going to be overwhelmed with the very same sense of grief regardless whether she’s, let’s say, American or Arab. But (Western) photojournalists won’t depict such mothers in the same fashion. The American mother typically will be given a kind of visual dignity — unlike the Arab mother. This poses a huge problem, and discussions around this particular topic unfortunately are only in its infancy. You could argue that, well, that’s photojournalism with all its various problems. Why do we have to worry about that when dealing with, for example, a long-term documentary project of a particular person suffering from mental illness? We do have to worry about the idea of the cliche here for the same reason as in the case of photojournalism. It’s easy for me to call types of depictions cliches. But the moment a type of depiction becomes ubiquitous while, at the same time, falling short of necessary nuances, then you’re in cliche territory. And unfortunately, photography projects dealing with mental illness all-too-often fall into this particular trap. I’m writing this article as someone who is personally familiar with mental illness in the form of depression. I have first-hand knowledge of what it feels like to be at times often extremely depressed. I also have seen various attempts to depict depression — moody looking people, bland pictures with a lot of grey tones (Emo Photo 101). I understand the idea behind such depictions. But I can tell you that such depictions don’t even come close to conveying what happens to you when you’re depressed: you don’t merely live in a grey cartoon world. This all makes attempting to work on mental illness possibly one of the hardest challenges you could imagine. Given the preceding, the only sensible solution that I can think of can only be to be mindful of the pitfalls and to find ways to work around everything that the camera cannot show. A crucial aspect of such an approach probably should be to give voice to the person who is suffering. In all likelihood, you will never be able to convey what they will be feeling, in particular given that that’s already based on your own understanding. But you will have to live with that. And on top of that, everything should be based on an approach filled with dignity, acceptance, and affection — it’s that approach that’s usually entirely missing from photojournalism. 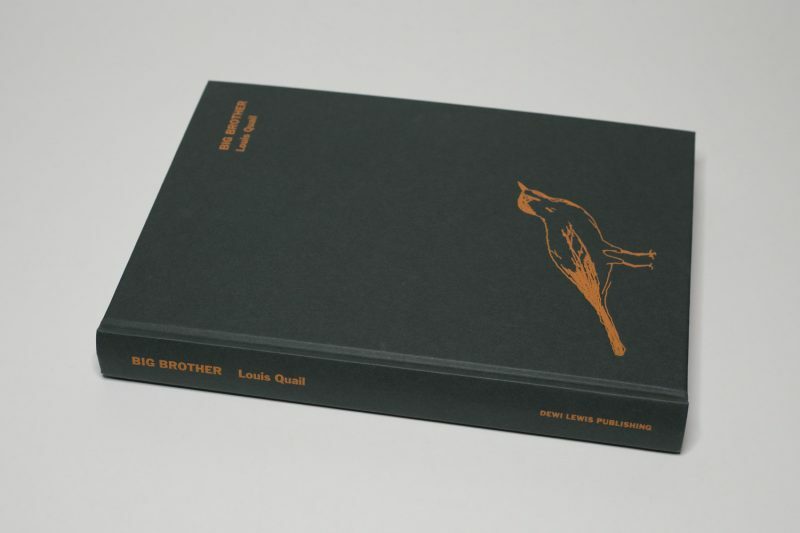 Louis Quail‘s Big Brother is a new book that approaches the subject mental illness in the form of the photographer’s brother’s schizophrenia. Whatever stigma there might exist around depression, for sure schizophrenia is a topic most people would rather not deal with. Where depressed people are mostly “just sad,” people with schizophrenia are… well, what are they? To be honest, I didn’t know, either — until I finished looking through and reading this book. In the book, Quail takes a multi-layered approach to describe his brother Justin and their relationship. In addition, there is a third person, the brother’s long-term partner (who also suffers from various afflictions). On top of everything, there’s society in the form of neighbours who don’t — or maybe can’t — understand and who thus create all kinds of problems. And there is the state, a state ruled by a mindset that basically cuts funding for mental health (and health in general), only to thus shift the responsibility for dealing with problems from trained mental-health specialists to the police who obviously aren’t trained to deal with this whatsoever. Quail introduces all these different characters in some form. The photographs focus on the brother and his partner. The text — there is ample text — speaks of various aspects that either cannot be shown or for which there simply are no photographs. In line with strategies now commonly used in photobooks, there are facsimiles of documents. But, and this is the key aspect here, there also are reproductions of Justin Quail’s poems and artworks (drawings and paintings), including a little booklet at the very end of the book. Much of the portrait of the brother focuses on his life and not merely on his illness. Justin Quail is an avid bird watcher, and this activity is explored in some depth. He also is just a good guy and brother whose mental illness interferes with what otherwise would simply be an ordinary life. Justin Quail is trying to lead an ordinary life, just like the rest of us, but his illness won’t let him. This is the main insight I took away from this tremendous book. Most of us even know that defining someone by or through an affliction they have to deal with does them a huge disservice. So we ought to be careful with that. But do we really know why? If I look at all the discussions around the phrase “political correctness,” then both on the right and the left, the idea that it’s just some sort of artifice to stifle people’s freedom of expression appears to be widely spread — even in circles where you’d think people know better (yes, I’m looking at you, photoland). So Big Brother not only does an amazing job bringing the life and suffering of Justin Quail closer to a general audience, it indirectly also teaches us why we should be careful with how we talk about people, especially people whose afflictions we simply don’t (can’t) comprehend. Lastly, though, the book is testament to deep brotherly love, evidence what dignity, acceptance and affection can lead to — a marvelous achievement.